if rasps be seane, to one gallon of the pulp of red currants mix your rasps wth the currants and mash them before you put in the water. 69 Mrs Liddells Ripe Goosberry Wine Take your fruit when full ripe but no way decay'd pick & bruise your berrys in a tub then measure your pulp and to every gallon of pulp put two quarts of water which must be first boyld & then cold again. 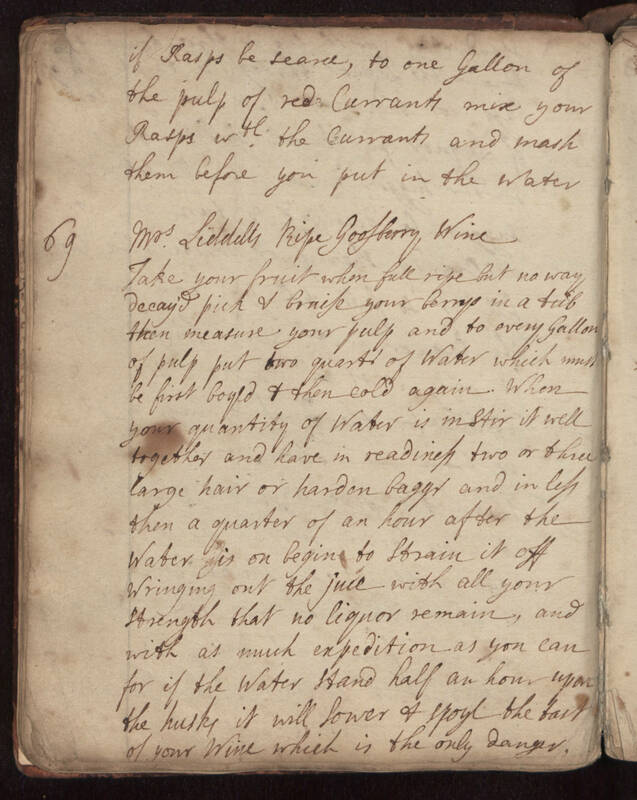 When your quantity of water is in stir it well together and have in readiness two or three large hair or harden baggs and in less then a quarter of an hour after the water is on begin to strain it off wringing out the juce with all your strength that no liquor remain, and with as much expedition as you can for if the water stand half an hour upon the husks it will sower & spoyl the tast of your wine which is the only danger.